Everyone knows that collaboration is essential for all types of businesses in the modern working climate. Some of the best products on the planet have been made through collaborations (remember, there’s no ice cream without Ben or Jerry!). There are so many ways to collaborate, and it is essential that brands try it as much as possible. When people are thinking about business collaboration, it’s easy to get confused about the best route to go down. 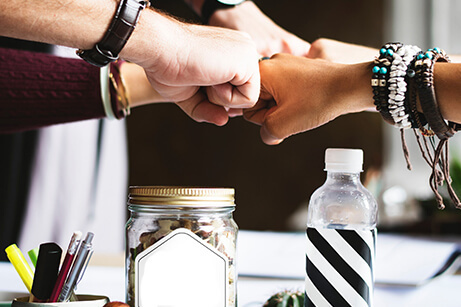 Here are some of the best business collaboration ideas for both inside and outside of the office, skyrocketing business growth along the way! The use of interactive displays (which are a fantastic alternative to interactive whiteboards) greatly benefits collaboration both in the offices and with other businesses. Using the displays means that workers can collaborate with those doing their jobs remotely and get more ideas off of each other. As they can be written on, amongst many other features, they are great for mind mapping. They can also be linked up to collaborate with other departments and sometimes even different businesses for brain storming sessions. Starting a podcast is a great business collaboration idea to connect with other people in your niche and who have similar interests. While not every brand has a podcast and it’s not something that will immediately drive sales, it is a fantastic way to network and build connections, as well as presenting yourself as a brand that really cares about the work that it does. Having a popular podcast will also skyrocket brand loyalty, as people will be constantly tuning in to what you have to say about different matters. By visiting networking events, you’ll get the chance to meet people in person. If you want to reach people to collaborate with, here is your perfect opportunity. You’ll also get the chance to bounce ideas off of people and be inspired. Guest posting on other websites or blogs has all of the benefits of posting on social media. Your brand gets a shout out to their audience and you could get new customers because of it. It is also great for SEO. Most websites allowing guest posts will let you earn a link back to your website, helping you be found in Google searches. And of course, you can do it the other way around – get free content for your blog or website by allowing guest posters. Remote work has been on the rise for quite some years now. But just how exactly do people collaborate while working remotely? Different technology helps, such as Slack and Trello. It is also important to make sure that remote workers know exactly what is expected of them in terms of collaboration. Company leaders should clearly demonstrate exactly what they want and how they want it executed. The future of work may very well be remote, so any forward-thinking company must ensure that they have a correct policy in place for collaboration with remote workers. One of the best ways to collaborate with people in the office is to take advantage of different people’s personality types and how they like to work. Bitrebels states that “when you find the right collaboration of people, you’ll instantly know it since everything will seem to be a whole lot easier to manage”. Knowing exactly how different people work and how this can be played to the company’s advantage is a great way to grow a business quickly though collaboration. Maintaining an air of transparency about company short term and long term goals is crucial to successful collaboration. If an employee knows exactly what they are working towards, they will be able to collaborate better and subsequently find the exact way to work towards any goals or overcome situations. Fluid workspaces are a great way to stimulate creativity and collaboration. People used to meet in boardrooms, but now they tend to favour huddle rooms which are a lot smaller and require less resources. Huddle rooms are generally intended for collaboration, so it makes sense to use these when jointly working on projects together. Most businesses are well aware of the benefits of collaborating with people in their own departments. But collaborating between departments is a great way to maximise growth. Sales and marketing particularly work well together. Salespeople get first-hand knowledge of customers and their objections, which is crucial for marketing. This makes a connection between the two teams invaluable when it comes to creating marketing campaign. Marketing people also know how to deal with customers in creative ways, which could help the sales department. These ideas showcase just some ways that businesses can ensure that they are collaborating in the modern world. With the popularity of remote work and the rise of employees using their own devices, it is unsurprising that many businesses are looking for more creative collaboration ideas. However, with the rise of collaborative software’s and social media, there has never been a better time to begin to learn how to collaborate effectively, both within the business and beyond. To explore more top tips for collaboration or to meet with Avocor, why not Register Free here for UC EXPO 2019?